Whether you’re looking for a boy scout craft or girl scout craft project or a project to work into an educational seashore session, this inexpensive crabby craft is a winner. The modest materials make it affordable for large groups…but they’ll still be a ton of fun to make! The ingredient list is per crab, so scale up as needed. Also, they’re a less than 15 minute to make project and being presented today as part of Craft Lightning with Country Chic Cottage and 30 Minute Crafts. Step 1: Cut toilet paper rolls. You’ll need one toilet paper roll whole. Cut the second one in half, then cut out notches as shown in the photo to make claws. Keep the notch cut-outs, they’ll be used later on for the crab’s eyes! Step 2: Paint. Have the kids paint the toilet paper roll parts red. I only painted the outside of mine, but they’re free to follow their creative bliss. Step 3. Poke holes. You’ll need to poke three holes in the bottom of either side of the whole toilet paper rolls. I just used the end of my scissors for this, but if you need to use a hole puncher with the kids, that will work, too. Poke one hole as shown in each of the claw pieces. Step 4. Thread pipe cleaners. Cut each of the three pipe cleaner in half. In the outside and middle holes, put the cut in half pipe cleaner through halfway. Twist the pipe cleaner around to secure it to the roll and bend to make two little crab legs from each pipe cleaner. On the last hole, put the end of one of the cut in half pipe cleaners through and twist to secure so the pipe cleaner is almost its full length. Do the same process on the other side’s holes so when you finish your crab has eight legs and two arms for its claws. Put the claws on the long, unbent pipe cleaners to make crab claws. You can play with the legs to bend them all to the points where the crab stands up! Step 5: Attach Eyes. The notches that got cut out to make the crab claws need just a little bit of a bend near the flat bottom part. This will give us a place to glue them onto the toilet paper roll. Glue the bottom of the bent paper to the top of the crab body, then glue the google eyes to the flaps. For a great finishing touch, draw on a smiley face! Your scouts or campers will love this crabby craft! 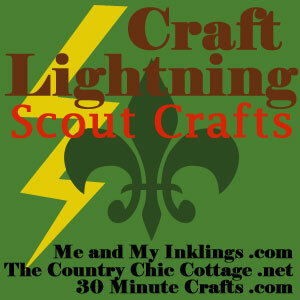 Be sure to see more Craft Lightning scout craft projects by clicking on the link below! I love this project -perfect for preschool too! Would love to have you share this on the Pleasures of the NW’s DIY party! This is so adorable! Now we know what to do with all those TP rolls! I can only imagine the look on the faces of my family and friends when I ask them to save their toilet paper rolls for me!